How do I know my marquee will fit in the garden? If there is any worry about space limits, we confirm sizing with a site visit to your venue. How many people can you fit in a 12m x 12m marquee? Please view the marquee capacity table. Can I get everything from Four Jays? The only thing we can’t supply is food, flowers and music – although we can recommend suppliers who can help with this. During the summer matting or carpet is suitable but will run with established ground levels, whether grass or tarmac. If your site slopes we recommend a levelled steel framed sub-base floor system covered with matting or carpet. Winter marquees may require other options depending on the weather and ground conditions. Please ask for advice. Do I have to arrange an electrical supply for the caterers as I do not really know what capacity they require? We can provide a generator and further power cabling for your event. However caterers usually require the largest volume of power and we specifically need to be advised by your chosen caterer as to the capacity they need (helpful to know the type of equipment they will use) and we will provide a quotation. It is important that we can liaise with the caterer to make sure that you do not experience unexpected power failure. Are your marquees safe in wind? All of our marquees are bought from reputable suppliers who comply to industry standards. We are members of MUTA, renowned as the Association for highly regarded marquee hire companies. We and our marquee teams get audited by MUTA annually to ensure we comply to their guidelines and requirements of membership including health & safety. Our installation teams are fully trained, with team leaders holding Temporary Structures NVQs. They are substantial structures with PVC covers as described above, they are wind loaded up to 48 mph in normal conditions and are able to be used in the snow, as long as the roof is kept clear of snow and the marquee is heated inside. Can we have heating if its cold? Yes we can provide thermostatically controlled heaters and solid doors to help keep the heat in within marquees in colder weather. However if your request as last minute, we cannot guarantee that we have the available stock. How long does marquee take to set up? It depends on the size of the marquee. Most wedding marquee frames and covers are completed in a day, with other internal equipment you have ordered, extending the time we will be on site. More complicated events will take longer.Timing is always weather and ground conditions dependent and can not be guaranteed. How do I know I am planning the correct size of marquee? 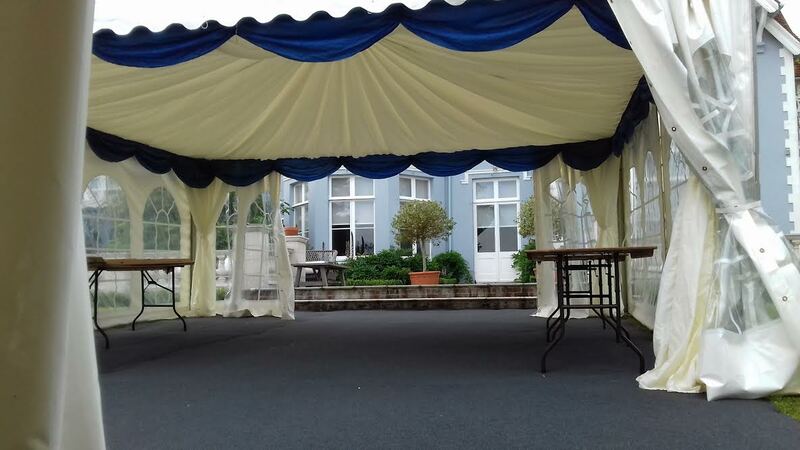 Suitable marquee size depending on the space you have available, whether your guests will be standing or seated, whether you require room for a reception area, seating area or dance floor, space for a buffet or bar? We have basic capacity information our marqees page. Please talk to us to discuss what would best suit your needs. We have some standard wedding packages that you can use as a guideline but please call us to get a full quotation encompassing all of the items that you would like. A quotation may be subject to a site visit particularly if space is limited or uneven. The hirer is responsible for any equipment which is lost, stolen or damaged whilst on site, therefore we would recommend that you insure the items to cover payment of the replacement costs if any of these eventualities were to happen. Household insurers may be able to add cover to your existing policy, and we recommend you ask specifically, and there are insurers who provide bespoke insurance cover for events or weddings. Insurance for hired-in plant for businesses ( Commercial Hire Equipment) will usually be able to provide cover for long term hire contracts.